Back in the Dark Ages when my poor father heard me use the words "medieval history" and "career" in the same sentence for the first time, he asked if I could recommend one book to introduce the period I was studying. At the time I recommended a dozen, all of them inappropriate. Now having read John Howe's “Before the Gregorian Reform”, I have the right book to recommend. In this comprehensive and accessible survey of two hundred years of church history, Howe pushes back against the picture of a medieval church that only became vibrant and expansionist at the end of the eleventh century. Historians of church, state and Latin culture have taken the years from 1073 –1215 to be a formative period: a twelfth-century "Renaissance," or more recently and provocatively, "Reformation." "Renaissance" and "reform" make powerful claims whose effects should be acknowledged. They indict immediate predecessors as decadent, primitive or simply forgettable. With notable exceptions, the tenth century has fared particularly badly, especially the western remnant of Charlemagne's Frankish empire. A narrative of decline and fall at the hands of outsiders (Vikings and "Saracens") sets the scene for transformation, which scholars locate variously between 1000 and 1100. In the last few decades, historians of the central Middle Ages have debunked the twelfth-century Renaissance in piecemeal fashion. They have shown intellectual continuities from late Antiquity, especially in Apocalyptic thought; a "state" that counters images of tenth-century "feudal" lordship and/or anarchy; and ecclesiastical reform since the Viking raids. But they have not synthesized these continuities. By treating the term "church" in the broadest sense to include not just priests, monks and nuns but also kings, elite patrons and common lay devotees, not to mention buildings, objects and even sound, Howe does just that. The result is a richly textured and arresting image of a world rooted in its Carolingian past yet foundational to the expansionist and ecumenical church of the later Middle Ages. Fittingly, Howe begins with the Carolingians before moving to invading groups: Vikings, Magyars and Muslims. (His center-periphery model does not consider "invasions" back and forth between the Carolingians and their neighbors.) Howe assesses the damage to churches, and decides that the Apocalyptic pronouncements of chroniclers speak to cultural wounds: the loss of monastic archives and property charters, some serious psychological harm, and a sharp decline in hagiographical literature. He attributes a restoration of "morale" to an increase in military fortifications, even as it came at the cost of centralized power in west Francia. East Francia and England consolidated thanks to alliances that Ottonian Saxon and Anglo-Saxon rulers made with their respective churches. Meanwhile the Scandinavians and Magyars became Christianized after a fashion. (Note: this is hard to assess simply from the disappearance of pagan temples, since churches were used for pagan ceremonies). Reform came soon after. 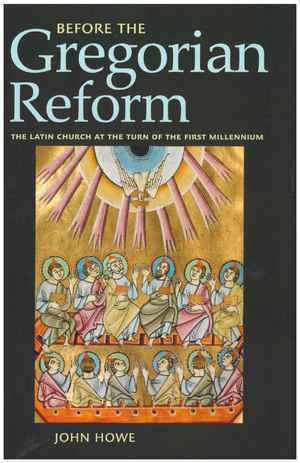 Used in the tenth century to mean building restoration, "reform" was a collaborative process among many social groups with ecclesiastical donations peaking before 1000. While he acknowledges the importance of Cluny, the author notes the Lotharingian reformers that Kassius Hallinger and others have highlighted. He also describes other reforms, such as tighter administrative structures in the church, created to match changes in tithe legislation. The "sacred geography" of high medieval Christendom was in place after 1000. And according to Howe, much of it remained rooted in early medieval forms. Tenth-century Ottonians built grand monastic structures to serve as backdrops for their itinerant courts, while Anglo-Saxons reiterated the style of older church structures. Even in west Francia, one might reinterpret a seemingly "mutationist" chronicler like Raoul Glaber: his "white mantle of churches" refers as much to enhancement of existing structures as it does new buildings (p. 110). However, emergent urban communities did stimulate a new form of church architecture: bell towers, including free-standing campanili. Howe sees in these projects a "democratization" of patronage by which he means lower-level elites taking charge of donations. Yet that argument is complicated if we consider that some of these middling groups had not distinguished themselves before 1000. In these beginnings, Howe rightly identifies the distinctive theme of high medieval Christianity: its "incarnational character" (see p. 175). Co-emergent with new spiritual concerns came an emphasis on the value of praesentia and material experience for drawing in the uninitiated and disciplining the religious. This took the form of a revival in holy relics, fueled by an infusion of new, recently dead saints who became models for earthly conduct. The expansion of relics meant a proliferation of altars. Ecclesiastical paraphernalia increased, much of it gold and silver. (Howe gives us an insight into one reason why: they were easy to purify.) The earliest crucifix comes from the early period of the millennial church (ca. 970) as do votive statues. In some of these material developments, Howe sees Byzantine influence, spurred by Ottonian desires for imperial trappings but also perhaps by the infusion of relics into Constantinople after the Muslim conquest of Jerusalem. While Greek Christianity did not have much impact on literature in the Latin church at this time, its emphasis on manual labor, askesis (asceticism) and interiority mitigated the dangers of "incarnal" religiosity. In liturgical practice, too, Howe sees the contribution of the millennial church: not so much the inflation associated with Cluny (which only happened mid eleventh century) but customaries that made daily communion incumbent on the religious, processions that generated new sacred space and enhanced interest in Roman liturgy, both among post-Carolingian churches and the Anglo-Saxons. Howe makes the intriguing but not entirely persuasive suggestion that the large gatherings associated with public liturgy trained peasant groups in mass political assembly and rebellion. Certainly, clerics did see continuity between lay peace assemblies and lay revolt but more evidence is needed. Howe remains astute about continuities and borrowing, regularly using the Anglo-Saxons to offset claims of heavy Carolingian influence while still acknowledging the impact, say, of Carolingian literacies on the education of millennial churchmen. As with material culture, the vision of education he presents is a dynamic one: intellectuals of middling birth, itinerant in their search for liberal arts training infusing the old scientia divina with logic and argumentation: the basis of later scholastic theology. Indispensable to any medieval history syllabus, “Before the Gregorian Reform” does exhibit a problem in its basic framing. The blurb, title and some of the overarching claims give the impression of the author kicking down an open door, one that he actually helped to open. As a history of medieval Europe either side of the millennium this book so effectively demonstrates continuity that it might have been better to simply ignore outdated signposts. Chief among these, the titular "Gregorian" reform is a straw man. For decades now, as Howe does recognize, scholars have emphasized the transformative papacy of Leo IX, with which this book concludes. As he notes, they have identified earlier reform at Cluny and in Lotharingia, in obscure parishes of medieval Italy and in the decretals that preceded Hildebrand-Gregory's imprint on the papacy. It would have been wiser then for the author to have retained the provocative title that he appears originally to have considered: “The Millennial Church”, which better expresses the breadth of his vision and conveys the real importance of his contribution to our image of the Central Middle Ages. Charles Homer Haskins, The Renaissance of the Twelfth Century, Cambridge 1927; and emphasizing changes in thought, structures and spirituality Giles Constable, The Reformation of the Twelfth Century, Cambridge 1996. One exception is Heinrich Fichtenau, Lebensordnungen des 10. Jahrhunderts. Studien über Denkart und Existenz im einstigen Karolingerreich, Stuttgart 1984; See also Stephen Jaeger, The Envy of Angels: Cathedral Schools and Social Ideals in Medieval Europe, 950–1200, Philadelphia 2000. The classic, extreme position was taken in the 1860's by Jules Michelet in his Histoire de France. Recently, Jean-Pierre Poly and Éric Bournazel, La mutation féodale: Xe–XIIe siècles, Paris 1980, have reasserted the narrative of millennial transformation. Adjusted versions of the narrative also appear in Thomas N. Bisson, “The ‘Feudal Revolution’”, in: Past and Present 142 (1994), pp. 6–42, and Guy Bois, Lournand, village mâconnais de l'Antiquité au féodalisme, Paris 1989. Many of these studies use the work of Georges Duby as a touchstone, which Dominique Barthelemy complicates in his own engagement with mutationist historiography, La mutation de l'an mil a-t-elle eu lieu? Servage et chevalrie dans la France des Xe et XIe siecles, Paris 1997. On these diverse topics see James Palmer, The Apocalypse in the Early Middle Ages, Cambridge 2014; Elisabeth Magnou-Nortier, Foi et fidélité. Recherches sur l'évolution des liens personnels chez les Francs du VIIe au IXe siècle, Toulouse 1976; Matthew Innes, State and society in the early Middle Ages. The middle Rhine valley, 400–1000, Cambridge, UK 2000; Steven Vanderputten, Monastic reform as process. Realities and representations in medieval Flanders, 900–1100, Ithaca 2013; Richard Barton, Lordship in the County of Maine, 890–1160, Woodbridge, UK 2004. Kassius Hallinger, Gorze-Kluny. Studien zu den monastischen Lebensformen und Gegensätzen im Hochmittelalter, 2 vol., Rome 1950–51; Phyllis G. Jestice, Wayward Monks and the Religious Revolution of the Eleventh Century, Leiden 1997; John Nightingale, Monasteries and Patrons in the Gorze Reform, Oxford 2001. See Uta-Renata Blumenthal, The Investiture Controversy: Church and Monarchy from the Ninth to the Twelfth Century, Philadelphia 1988; Colin Morris, The Papal Monarchy: The Western Church from 1050–1250, Oxford 1989; Amy G. Remensnyder, “Pollution, Purity, and Peace: An Aspect of Social Reform between the Late Tenth Century and 1076”, in: Thomas Head / Richard Allen Landes (eds. ), The Peace of God: Social Violence and Religious Response in France around the Year 1000, Ithaca 1992, pp. 280–307; Brett Edward Whalen, The Medieval Papacy, Basingstoke 2014. Jehangir Y. Malegam: Rezension zu: Howe, John: Before the Gregorian Reform. The Latin Church at the Turn of the First Millennium. Ithaca, NY 2016 , in: H-Soz-Kult, 21.03.2018, <www.hsozkult.de/publicationreview/id/rezbuecher-27845>.